and using USBISP fuse bit follow inside arduino (mega.bootloader.low_fuses=0xFF,mega.menu.cpu.atmega2560.bootloader.high_fuses=0xD8,mega.menu.cpu.atmega2560.bootloader.extended_fuses=0xFD. Please help me, what's wrong. Attached are setting and video. Perhaps Cliff's tutorial on recovering a "bricked" AVR will be of help. The tutorial can be found: HERE. Perhaps a Moderator would consider making Cliff's un-bricking tutorial a "sticky" in the Tutorial Forum. Report back on your progress. Serial programming fuse seems to be disabled -> Follow DocJC. Does it have the bootloader? Can you connect to the bootloader? I am newbie, so don't understand when reading your link. and I using Progisp 1.72, I haven't AVR Studio. Before fuse bit, it had bootloader, After it haven't. With Uno, do it same this one, It working. I don't know how to do it with Arduino Mega as it worrking. The Uno comes out of the box with a Bootloader. The Mega2560 comes out of the box with a Bootloader. There is no need to use an external programmer unless you need debugWIRE or JTAG. 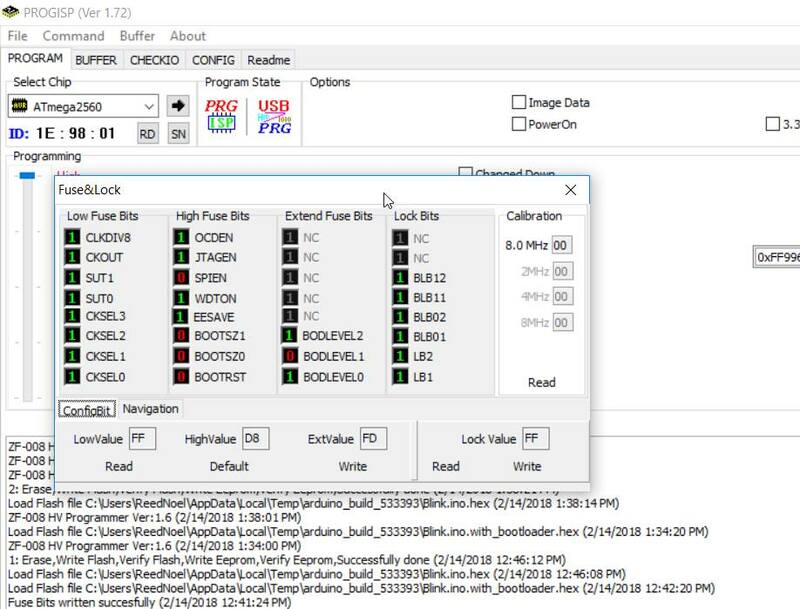 All regular HEX files can be uploaded to your Arduino hardware with the Bootloader. If I write a program in CodeVision or AS7 I still upload it with the Bootloader. You are not tied to Arduino in any way. If you brick your AVR by setting the wrong fuses, you can often recover by supplying an external clock signal to XTAL1. If you set RSTDISBL on a Uno, you might just as well buy another clone Uno. The Mega2560 does not have a RSTDISBL. so you should always be able to recover. I want that, fuse bit and lock chip on Arduino Mega2560. with arduino, It have everything,.. include pinout already.